Ben Swann makes a great point here. As taxpayers, we foot the ultimate bills for these debates and for the political process itself of the Republican Party. In fact, the GOP is supposed to be founded on constitutional principles and dedicated to free and fair elections. This is anything but that. I support Ted Cruz and want him to be the nominee, but I strongly believe that Donald Trump should be given fair treatment. To threaten the man in this way is thuggish. I am not one for word games or for dishonesty, but if I were Trump I would commit to the Republicans with the caveat that if they screw him, he will do as he pleases. If it is a fair race and Trump loses that is one thing. If the Republican elite try to squeeze him out and dishonestly shove him aside whether he should be the nominee or not… then all bets are off. Trump is not one to roll over and just take it from the likes of corrupt RINOs and Marxists, that much I’m sure of. Billionaire and 2016 presidential candidate Donald Trump makes new headlines every day. But something he said that he wouldn’t do during the first Republican debate could reveal some major problems with the debate system. Could the GOP ban Trump from its next debate? Trump was the only candidate who said that he might run as an independent if he doesn’t get the GOP nomination. Not only is that a difficult path to take, but also an expensive one. Trump is probably the only candidate running who could afford to launch an independent campaign. Because Trump said he would not rule out running as an independent candidate, the Republican National Committee (RNC) has now said it could ban Trump from the next debate if he won’t make that pledge. RNC Chairman Reince Priebus has since directly requested all Republican candidates to pledge that they will not make a third-party run, according to ABC News. Those who do not pledge might not get an invite to future Republican candidate debates, and would likely be restricted from accessing party data on Republican voters. If Trump is polling at twice the numbers of his closest challengers and as much as five times the numbers of seven of the top 10 candidates—which he is—then how could the RNC ban him from debates? Can that really be done? The answer is yes. The RNC, just as the Democratic National Committee (DNC), is considered a private club. They make their own rules. The DNC isn’t holding a single debate until October—something that candidates like Martin O’Malley aren’t happy about. But there’s nothing they can really do. “If I’m the nominee, I pledge that I will not run as an independent,” he said. What you need to know is that the RNC claims it has every right to prevent Trump or anyone else from debating because it is a private club. But—Reality Check—in actuality they are not. In fact, American taxpayers spent $400 million administering Republican and Democratic primaries in 2012. That is one of the major problems with the way the party conducts business. On average, only about 9 percent of the voting population vote in national primaries. But 100 percent of taxpayers are on the hook for these so-called private events. I have been in the Republican Party my entire adult life. I’ve watched how since Reagan things have been manipulated and twisted. How the GOP has gone down the very same path as the Democrats. For the first time in 30 years, we have a real chance at electing a true conservative and the GOP is doing all they can to scuttle that. But they didn’t count on the likes of Donald Trump or Ted Cruz and they are just wetting all over themselves because they feel they’ve lost control. Karl Rove is hiding in a hole somewhere trying to sabotage things and put us back on his Progressive path to destruction and subservience. 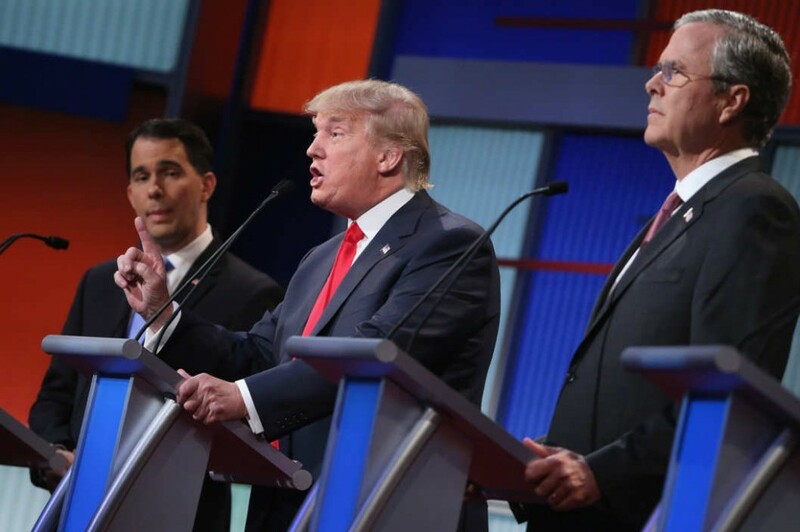 If Trump is banned from future debates, you will see a revolt and a shattering of the Republican Party. I used to think that a third party would be handing it to the Hildebeast. Now, I’m not so sure. Trump might get even more popular if he does that. He’s becoming a political force to be reckoned with and he loves to hunt the GOP. Watch where you tread guys – avoid the steaming pile of fascism you are about to step in.